La Società di Santa Rosalia di Santo Stefano Quisquina (Santa Rosalia Society) is a non-profit, charitable organization that promotes preservation of cultural traditions, family and giving back to the community. The society was founded on March 19, 2005 in Milwaukee, Wisconsin by direct descendants of Santo Stefano Quisquina, a town in the province of Agrigento in Sicily, Italy. The patron saint of this religious town is Santa Rosalia, after which this society is named. 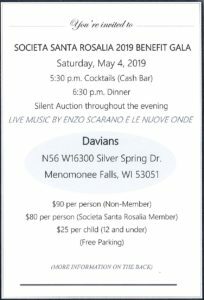 Almost all founding members of the organization either immigrated themselves directly or are children of those who immigrated from Santo Stefano Quisquina and now reside in Southeastern Wisconsin. Many of these founders had to leave family and their lives they knew behind in search of opportunity in the United States. The Italian/Sicilian culture, customs, spirit of selflessness and generosity did not get left behind. These will be preserved in the Milwaukee community through the existence of this organization for future generations so that roots may always be respected, appreciated and remembered. 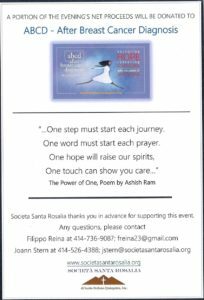 Copyright © 2019 Societa Santa Rosalia. All rights reserved.